This article analyses where players fish in the game World of Warcraft. It reveals the role of daily quests in shaping our fishing habits, demonstrates just how popular city-fishing is, and starts to reveal why we fish. This is (hopefully) the first in a series of articles that collectively examine why people fish in this massively multiplayer online game. The map shows number of successful fishing casts (diameter of each circle), by area. Numbers are daily totals for all United States and European realms combined, based on a sample in July 2009. Click the map for a larger view. A successful cast is one that does not catch a junk item, which might occur if the anglers’ skill is to low. There are 14 million successful casts each day, catching 16 million fish: Some casts catch more than 1 fish. In addition, there are 4.5 million unsuccessful casts (that catch a junk item). Unsuccessful casts are not shown on the map. “Old Azeroth” refers to the continents of Kalimdor and the Eastern Kingdoms (the pre-expansion game). Within Northrend (the main area shown on the map), casts into coastal waters are shown separately from “inland” casts in other zones. Open Water (dark blue) – Casts into bodies of open water. Daily-Related (gold) – Casts while trying to complete a daily fishing quest. This includes all casts while trying to complete the quest, not just those that catch a quest fish. Pools (light blue) – Casts into schools of fish. Northrend is the continent hosting the current game expansion, Wrath of the Lich King. The continent is home to higher-level (more veteran) players. Expect to find most fishing activity here – and we do: There are 9.3 million daily casts in Northrend – two thirds of all successful casts. A sixth of all casts are related to the daily quests, in spite of the fact that there is just one such quest available each day (the area varies between realms, randomly each day). 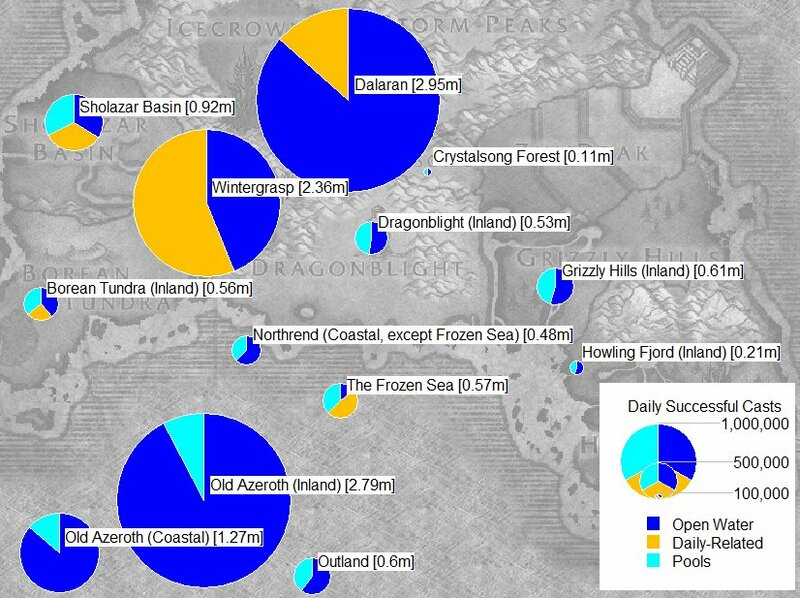 The Northrend fishing quests are the most popular quests in the game – completed by over 300,000 characters each day. No, really – at least before patch 3.2 was launched, which made Heroic dungeons popular again. Anglers’ might be motivated by the additional reward. Or this might suggest a far greater need to guide players. Either way, it raises some questions, such as, why is there just one fishing quest per day in the current game expansion? Ignoring daily quest-related fishing, the most popular single location is Dalaran’s Eventide Fountain, with 1.4 million casts per day – equivalent to 1 person on each realm fishing there for 12 hours each day. The irony is that Dalaran’s Eventide Fountain is also one of the smallest body of water in the entire game. Cities account for a third of all casts – Dalaran is not the only popular city. At least half of the “Old Azeroth (Inland)” casts are casts in the waters of major cities (such as Stormwind or Orgrimmar). So, half of all fishing activity is either directed by quests, or occurs in cities. Training (cooking and/or fishing skills) is also an important reason to fish, although it is harder to estimate how important. Pool fishing is normally the fastest way to catch “valuable” fish. Yet only 17% of casts are from pools. Even if we look at areas with no quests and desirable “Northrend” fish, like the Grizzly Hills, half of all casts are still in open water. This isn’t the only example that suggests that anglers really are quite lazy, and don’t want to much hassle when fishing.